Our daily schedule will include classroom instructions, individual therapies, playtimes (both indoor and outdoor activities) and nap/quiet times. All of these are intended to encourage the mental, emotional and physical health of our children. Furthermore, an on-site registered nurse will provide nursing care through-out the day. A Registered Dietitian will plan well-balanced meals and snacks for our children. Is my child a fit for Kids Unlimited Learning Academy? Every parent has deep feelings concerning the growth of his/her children. An open discussion with your child’s doctor/pediatrician is instrumental in knowing the needs of your child. Many physical problems are more pronounced than others and these can lead to certain developmental delays. Specific diagnoses that will qualify a child for KULA include, but aren’t limitied to: G.E. Reflux, Failure to Thrive, Drug Exposure, Lead Poisoning, Fetal Alcohol Syndrome, Chronic Renal Failure, Juvenile Diabetes, Environmentally at Risk, Sickle Cell Disease, Chronic Asthma, Down Syndrome, Autism, Chronic Otitis Media, Cystic Fibrosis, Spina Bifida, Cerebral Palsy, Hydrocephaly, Hearing Impairment/Deaf, Seizure Disorder, Mircocephaly, PICA and Communications Disorder. Does my child qualify for services? Day treatment services are available for children six weeks through age six. Outpatient therapy services are available for children six weeks through age 18. Children will be accepted by referral from a Primary Care Physician. For more information regarding qualification of services, we encourage you to contact us and make an appointment or come by for a personal visit and consultation. Our staff is eager to meet you! Are parents involved in care? KULA embraces a family-centered approach, ensuring that the child’s family is actively involved with a constant stream of communication between parent and therapist. When parents and therapists work together they both gain new insights that lead to a better understanding of the child, as well as more effective intervention. With this in mind, parents are invited to attend individual therapy sessions and semi-annual multi-disciplinary patient review meetings. 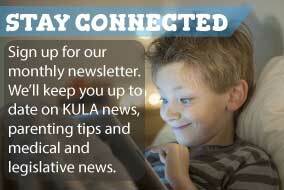 KULA children are either Medicaid-eligible or covered by private insurance or other health care plans. Private pay options may also be available. What are Kids Unlimited Learning Academy's hours of business? KULA is open Monday through Friday from 6:30 a.m. to 5:00 p.m. Does Kids Unlimited Learning Success Academy offer transportation? KULA does offer transportation to families who do not have adequate means to transport children to and from the Academy. Does Kids Unlimited Learning Success Academy offer clinical supervision for therapy students? Yes! KULA has many experienced therapists on staff who are qualified to provide clinical supervision. If you are interested in gaining pediatric clinical experience, please speak with your university’s fieldwork supervisor about us.